With the approaching birth of our second child, it became obvious that our 3 bedroom home was going to get a lot less spacious…and that I would have to give up my “office”. I use the term office a bit loosely since it is really a room to house my toys (i.e., computers, CDs, guitars, gadgets, etc.). I do actually work quite a bit from home as well, so it does have to function as a real office too. Having a spare bedroom in the house is very convenient, but explaining to your two kids why they have to share a room just so daddy can have an office might out weigh the advantages. As I began to ponder my options, I came across a very inspirational article by Brian DeHamer called “Working At Home – The Office” [link no longer valid – check out this article at Lifehacker]. Brian had a very similar dilemma, and chose a novel solution…to build a stand alone office in his backyard. Brilliant! Time to Google research my options. There are many ways to approach this type of project; build it yourself, hire it out, buy a prefab building, etc. After weighing the options carefully, balancing time against money, I chose to go the same route as Mr. DeHammer…buy a prefab building and finish it out to my specifications. Luckily for me my dad is a licensed contractor whom I can always count on for assistance and guidance (and I can figure out my way around most home projects relatively well). Time to get started! 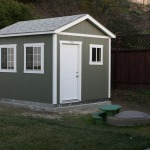 I spec’d out a 10’ x 12’ structure from Tuff Shed, the Premier PRO Tall Ranch model. 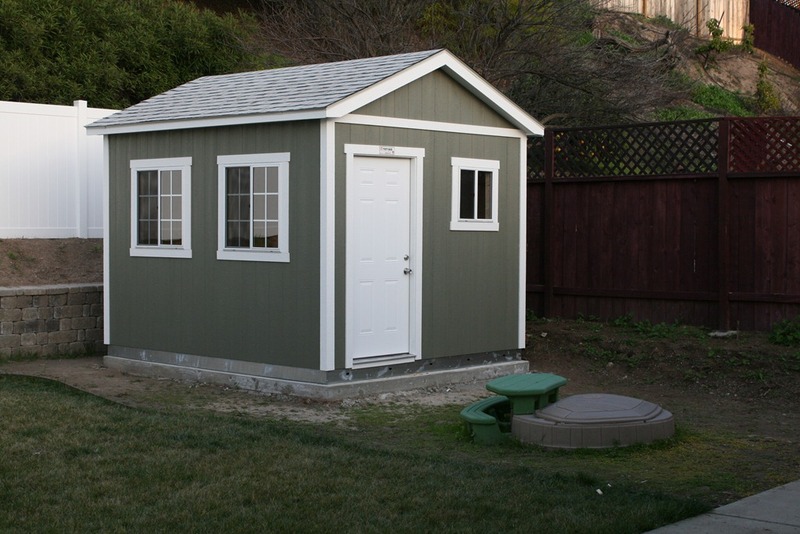 Typically, these are sold as sheds (albeit very nice sheds), but they are constructed very much like any other structure and can be customized to your liking. I went to their local office and went over the options and to take a look at them in person (they do sell models at various home improvement stores as well, but they are a little lower-end than the what you can get from them directly). Some of the key items to choose are orientation and sizes of the doors and windows. I opted for a standard 36” wide steel door instead of the wider “barn door” that they typically come with and three windows. I didn’t pick any interior options since I would be finishing it out myself. Once ordered, it takes a couple of weeks for them to build it in their factory (they are delivered with much of the structure pre-built). I was told that installation would only take about 4 hours once it was was ready. Now, it is time to prep the area where the office will be planted. 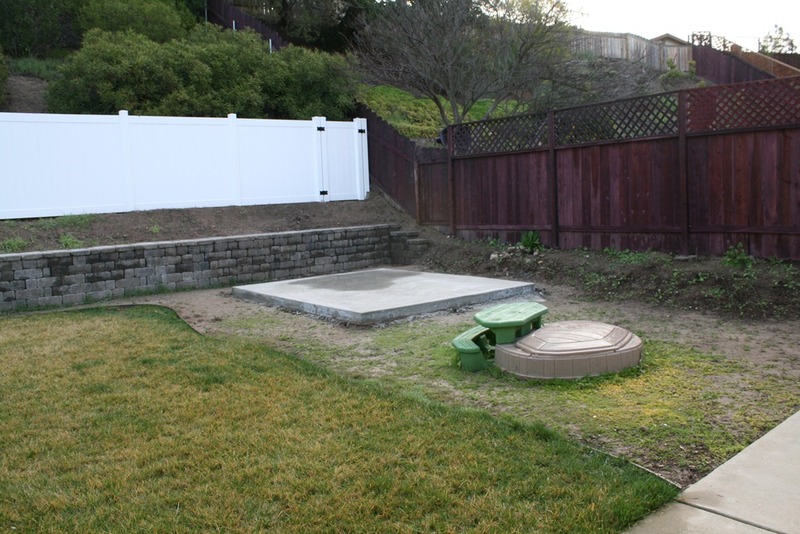 I chose the back corner of our lot so I didn’t interfere with any grass and play areas for the kids. Plus, since it won’t really match the house, it was a bit more aesthetically pleasing to have it set back. These structures are built on 6” galvanized steel beams, and can be set directly on solid ground if you wish (or in a bed of gravel). 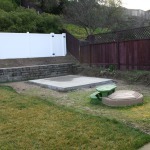 Since I wanted this to be as sturdy as possible, I opted to have a concrete slab poured. It was a little bit more of an expense, but it made me feel better about the structure’s stability and I’m always in favor of over-building if the cost isn’t too great. Just like clockwork the structure was ready from the factory in just a couple of weeks (just enough time to get that concrete slab poured). The crew of three guys showed up with the pieces of the structure stacked onto a small flatbed truck (I really wish I had taken pictures of this!). After showing them where the structure was to be placed and double-checking the options I had chosen, they got to work…and boy, did they work quickly! Less than four hours to go from “box of parts” to fully assembled structure. The one big regret I have is that I didn’t think to setup a camera to shoot a time-lapse video of the whole process, that would have been pretty cool.